Warlords is a 1980 arcade game developed by Atari. Atari released the game in both an upright cabinet and a cocktail table version. The upright version featured a 23” black and white monitor that was reflected in a mirror onto a castle wall background to give a 3D effect. Color overlays were used to give each castle a different color. The cocktail table version featured a 14” color monitor. The concept of Warlords is to ‘attack’ the other players by deflecting the fireballs to break through their castle walls and kill their king. At the same time, you must protect your own castle. You can either deflect an incoming fireball or catch it and aim it at another player. As you hold the fireball, however, sparks will attack and slowly destroy your own castle. When another player’s king is destroyed, an additional fireball is launched. The upright cabinet version allowed for 1 or 2 players against the computer, but the table version allowed for as many as 4 players to play simultaneously. Warlords was only a moderate success for Atari with a little over a thousand of each arcade type sold. In 1981 Atari released a port of Warlords for the 2600. The 2600 version was programmed by Carla Meninsky. Carla was one of only two women programmers at Atari and had previously programmed the award winning Dodge ‘em. Compromises were made with the graphics, but the game play survived the conversion to the 2600 intact. On the 2600, Warlords was played with paddles and as many as 4 players could play simultaneously. Warlords was one of the top selling games for the 2600 and became the ‘ultimate party game’ back in the early eighties. I can remember playing Warlords with my friends over and over ! In 2006 Darrell Spice set about to develop a better version of Warlords for the 2600. With a little help from some friends, he developed Medieval Mayhem with improved graphics, AI, and sound. Taking advantage of a 32K cart and bank switching, Darrell was able to develop a 2600 game that was much closer to the arcade version than Carla’s 1981 port. Darrell’s version includes an on screen menu with a number of options including fireball speed, catch, and multiple fireballs. The graphics are dramatically improved and include the dragon that starts the game by launching the fireball. You can read more about the development of Medieval Mayhem here. Atari never developed a version of Warlords for the 5200, but, in 2004, Bryan Edewaard developed a version which he called ‘Castle Crisis’. Since the Arcade units, used the same 6502 CPU and Pokey chip for sound as the 5200, Bryan was able to make Castle Crisis look and sound almost arcade perfect. In fact, it was so close to the arcade that Atari was not originally happy with Castle Crisis being released. Castle Crisis supports up to 4 simultaneous players, but, of course, you need to have a 4 port 5200 to take advantage of this. You use the standard 5200 joysticks to play Castle Crisis and I found the control to be satisfactory, but not as easy as with paddle controllers on my 7800. Some 5200 enthusiasts have developed their own paddle controllers to play this great game. Sadly, no 7800 version of Warlords has been developed. Fortunately both the 2600 versions of Warlords and Medieval Mayhem play perfectly on the 7800. It is always hard to decide which version is the best and this time it is particularly difficult as all of these versions are awesome. Although Castle Crisis is almost arcade perfect, I am going to give a slight edge to Medieval Mayhem as it is just more fun to play this game with paddle controllers. As a side note, Bryan has also developed an Atari 8-bit version of Castle Crisis and you play that one with paddles! So…if you have a 2600, 5200, 7800, or Atari 8-bit system, make sure that you get yourself a copy of either Medieval Mayhem or Castle Crisis! Both of these great games are available from AtariAge. Categories: 2600, 5200, 7800, Atari, Game Reviews | Tags: 2600, 5200, 7800, Atari, VCS, Warlords | Permalink. The 2600 version of Berzerk was released in 1982 and was a smash hit. 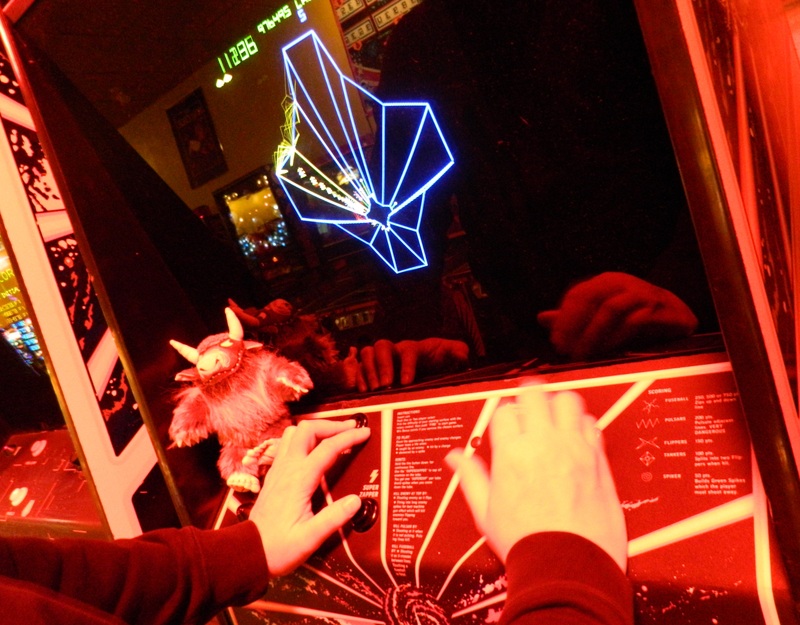 Berzerk’s simple graphics were faithfully replicated on the 2600 and the game play was almost identical to the arcade. Atari included 12 variations including ones with and without Evil Otto, non-shooting Robots, and even one where Evil Otto can be shot and will disappear for a few seconds. 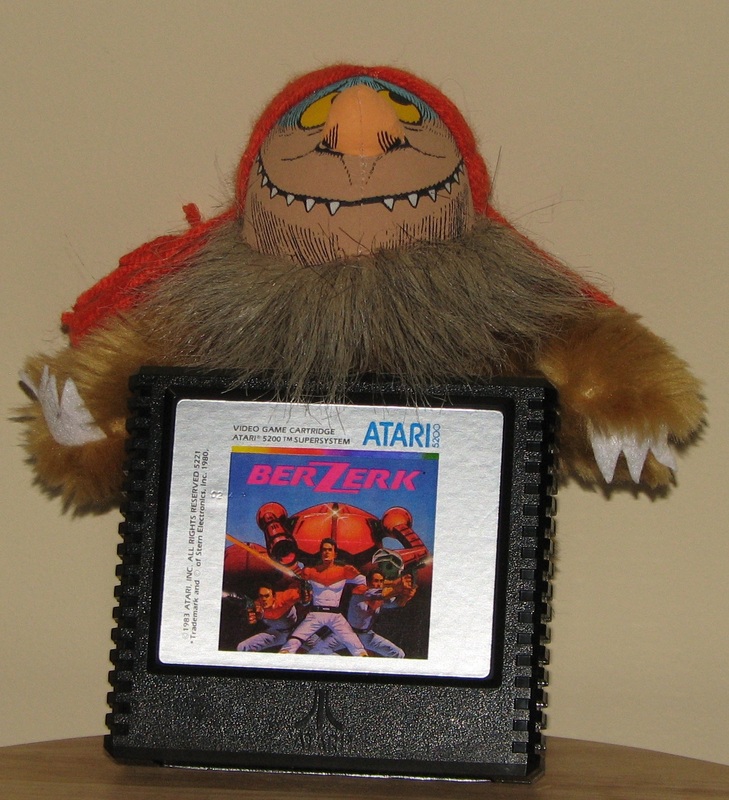 I fondly remember playing Berzerk over and over on my Sears Video Arcade (Atari 2600) in the early 80’s. It is a fantastic game and there was something cool about the green label and box. There was one big thing missing, however, from Atari’s 2600 version…voice synthesis. Back in 1982, most of us figured that this just could not be done on a 2600. 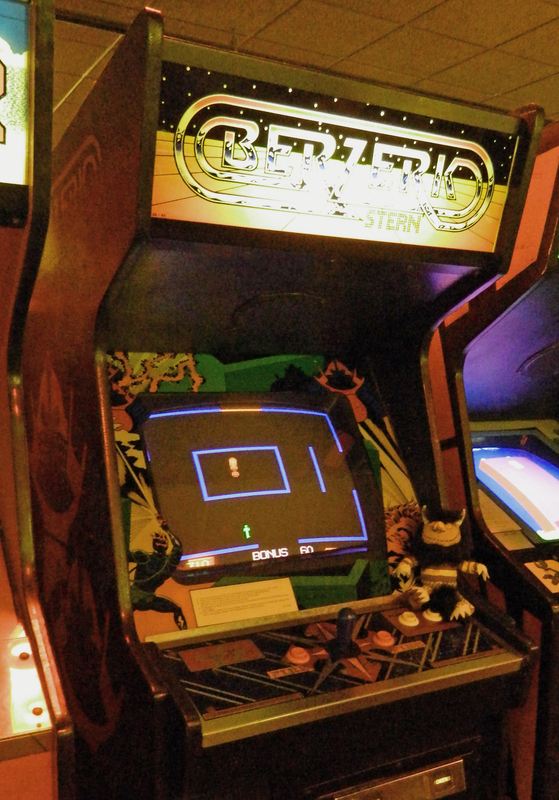 The 5200 version of Berzerk was released in 1983 and became an instant classic. Like its 2600 cousin, the 5200 version faithfully replicates the arcade graphics and game play. The 5200 version takes it to the next level and features full voice synthesis. Mike’s Berzerk VE for the 2600 is pretty awesome, but the 5200 version is one step better. The voice synthesis is tied to the game play so that when Evil Otto is about to appear, you will hear ‘intruder alert!’. The 5200 port is one of the best arcade conversions in the 5200 library and belongs in every 5200 collection. The only thing missing is a coin slot and ‘coins detected in pocket’. Sadly, no 7800 version of Berzerk was developed. Fortunately, the 7800 plays almost all 2600 games and you can play Berzerk or Berzerk VE on your 7800. One day, maybe, some enterprising homebrewer will port Berzerk to the 7800 with full voice synthesis. Until then, you can enjoy the regular 2600 version or the VE version. In 1982, Stern followed up Berzerk with Frenzy. Frenzy was similar, but a little more difficult than Berzerk. At least in Frenzy, however, it is possible to kill Evil Otto. Frenzy was ported to the Colecovision, but not to any Atari home consoles. A while ago, one homebrew developer was thinking about porting Frenzy to the 7800. Let’s hope that one day this comes to fruition. Categories: 2600, 5200, Atari, Game Reviews | Tags: 2600, 5200, 7800, Atari, Berzerk, VCS | Permalink. Tempest is a 1981 arcade game developed by Atari. Dave Theurer, a senior programmer at Atari, was trying to develop a 3D game similar to Space Invaders, but ran into a whole host of problems. Supposedly, Dave had a dream about monsters coming out of a hole in the ground, which gave him the idea for what became Tempest. The technology used in the Tempest arcade systems included Atari’s (then new) QuadraScan color vector generator, a 6502 CPU, and two Pokey chips for sound and I/O. There are a total of 99 levels in Tempest, with the first sixteen having unique geometric shapes. They then repeat, with varied color schemes and increasing difficulty, as the game advances. In additional to an unlimited supply of ammunition for your ‘Zapper’, you also get a ‘Super Zapper’ which can be used twice in each level. The first time that the Super Zapper is used, it will destroy all enemies on the playing field. The second time, it only destroys one, random, enemy. When all enemies are destroyed, you will ‘warp’ through to the next level. Tempest is also one of the first arcade games to let your pick your starting level. 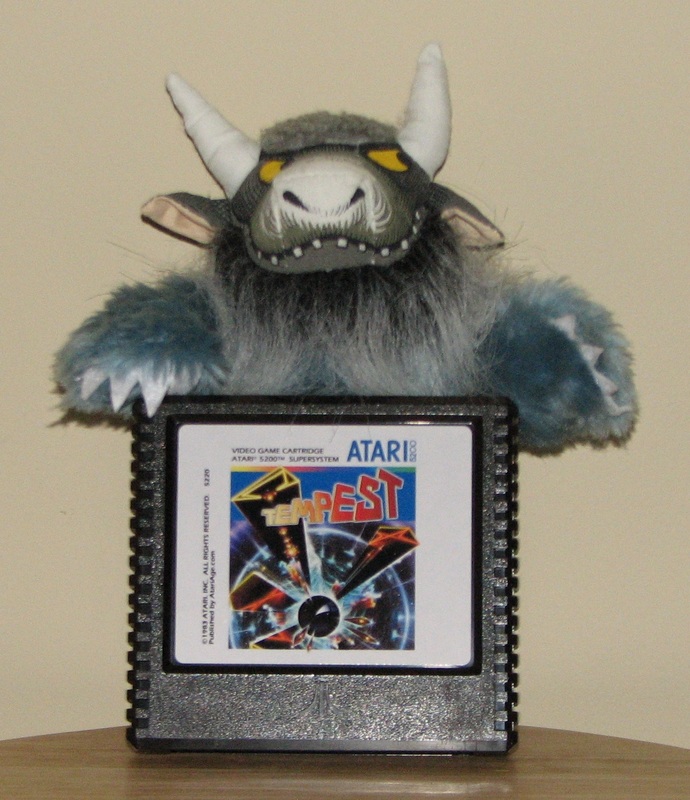 Tempest was a monster hit for the Atari coin-op division and it was ported to many platforms of the day including the BBC Micro, the ZX Spectrum, and the Atari ST. Ports were also planned and partially developed for the Atari 2600 and 5200 game consoles, but, until recently, were never released. Carla Meninsky developed the 2600 version which was planned to be released in 1983, but was never finished. The 2600 version plays with a similar concept to the arcade version, but the graphics are crude and the playing field is two dimensional. In her 2600 port, Carla did manage to include four enemies: Flippers, Flipper Tankers, Pulsars, and Fuseballs. Tempest was included as one of the games on the Flashback 4 (November 2012), so now it has been ‘officially’ released. I wanted to like the 2600 version of Tempest, but, honestly, it is pretty horrible. Graphics and 2D playing field aside, the control and collision detection are terrible. In fairness to Carla (who also programmed Warlords…an awesome 2600 game), she never had the chance to finish Tempest for 2600 and I am not sure why AtGames included it on the FB4. You can read more about the 2600 version of Tempest here. Another Tempest like game, 3D Genesis, was developed for the 2600 by Videosoft. Although practically complete, it too was not released until recently. Videosoft managed to create a better, if not perfect, 3D effect on the 2600. If you have a 2600 and like Tempest, you should take a look at 3D Genesis here. Keithen Hayenga, who programmed RealSports Baseball for the 5200, volunteered to develop the 5200 version of Tempest. Keithen worked closely with Dave Theurer and was able to use some of the same code as Dave had used on the arcade version. This was possible, since the 5200 also has a 6502 CPU and a Pokey chip for sound and I/O. This would make the sound and play of the 5200 version nearly the same as the arcade. Since the arcade units used vector graphics, there was only so much of the code that Keithen could use as the 5200 needed bit mapped graphics. Like the 2600 version, the 5200 version of Tempest was planned for release in 1983 and is featured as ‘coming soon’ in most of Atari’s advertising and catalogs in 1983. A 5200 (and 2600) Tempest box was shown in the 1984 movie ‘Cloak and Dagger’. Like most software projects, the development of Tempest ran behind schedule and came to a stop when Warner sold Atari in 1984 and let go most of the game programmers. For years, there was speculation, but no copy or prototype of Tempest for the 5200 surfaced until 1999. That copy was a version that was approximately fifty percent complete and attempts were made to finish the game, but with only limited success. Ken Van Mersbergen made the effort to track down Keithen in 2002 and they located a more advanced copy of the Tempest source code. Ken and Dennis Debro worked on the game, but never quite had the time to finish it. George Reese is credited with somehow sparking Keithen to contact Ken about finishing Tempest. With the efforts of Ken, Dennis, and Keithen, after nearly thirty years, a finished version of Tempest for the Atari 5200 SuperSystem was made available for sale by AtariAge at the Portland Retro Gaming Expo in September 2012. Of course the story doesn’t end there. Shortly after the expo, bugs were discovered in the Trak-ball control of the game, so back went the programmers to fix the bugs. Finally, in the past week, Tempest has been released with a beautiful reproduction box, a twelve page manual (in full color), and a cool cart label. The manual (which has had a life of its own), includes three pages on the history of the game. Tempest for the 5200 does not disappoint. Other than not being able to render vector graphics, the SuperSystem demonstrates its ability to be a ‘personal arcade system’ and Tempest rocks on the 5200. Since the sounds and game tables are the same as the arcade version, it is hard to imagine how it could get any better. Control with the 5200’s analog joystick is solid and, although I prefer the joystick, it also plays well with the Trak-ball. I did find that in later rounds, you have really work to avoid the spikes when using the joystick. This is definitely easier to do with the Trak-ball. All of the arcade levels and features are present, including the ability to pick your starting level. There is really not much else that can be said other than it is nearly arcade perfect! A huge thank you needs to go out to Keithen, Ken, and Dennis for their programming work to finally bring this arcade classic home. Thanks also to Michael Kosaka for his graphics work and to George Reese and David Exton for their work on the box, manual, and label for this game. Finally, a big thanks to Al Yarusso for all that he does at AtariAge and for his work to program, solder, and assemble all of the Tempest carts. At best, a few hundred (or maybe a thousand) copies of Tempest will be sold, so there is no big money being made here. In an era of overpaid celebrities and sports stars, it is really nice to see people do something to make other people’s lives more enjoyable. If you have a 5200, get over to AtariAge and order yourself a copy of this classic game. It may have taken thirty years to be completed, but you should not wait another minute to get your copy! Categories: 2600, 5200, Atari, Game Reviews | Tags: 2600, 5200, Atari, game, retro, Tempest, VCS | Permalink.